Owlhurst, and many smaller quarries. Bridge – previously Victoria quarry (1851), Bridge End quarry (1871). The Rally Road was used to transport stone from Bridge Quarry down to waiting boats on the canal. Edward (Ted) Allen (b.1907 d.1958, Linda‘s grandfather) was a stone mason. 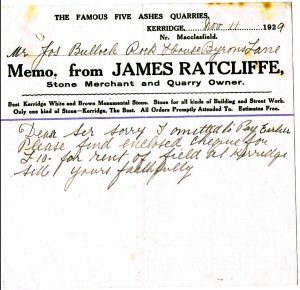 He owned one of the quarries on Windmill Lane . Although all the local history attributes the making of the the ball on top of White Nancy to one Tommy Cooper it was in fact Ted who made it. Tommy was head of the council at the time, and told the council he could make it. When he tried to carve a new ball it cracked in half. Ted, who was a fine stone mason, made it, and Tommy took all the accolades! As the town developed so the demand for coal increased enormously. It would be needed to fire the boilers at many mills, especially once they moved from water power to steam power. Oak Bank mill used 250 tons a week! Add to that the needs of domestic users – the coal fired range was the sole means of heating and cooking in most homes. There were many small coal pits in the district and the remains of many can be seen along the east and north sides of Kerridge Hill. Some of these pits were bell pits – a hole was dug down to the coal seam, then the coal was removed and the bottom of the hole got ever wider, until it started to fall in, at which point the pit was abandoned and a new hole dug a short distance away. Other pits were based on a shaft dug into the hillside following a seam of coal. Also still visible are the tracks that connected these pits together and to the roads to enable the coal to be taken away from the hill. Some tracks are today used as footpaths, others are just marks along the hillside. 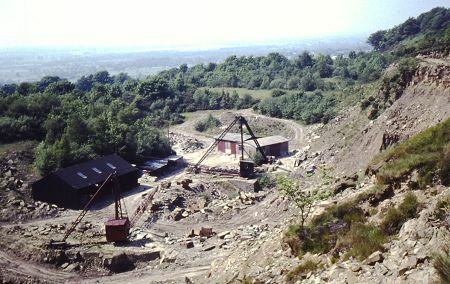 The biggest pit in Kerridge hill was on the west side and developed by William Clayton. This pit had shafts and galleries. There was also a tunnel through the hill to access pits on the east side. A feature long believed to have been a ventilation shaft which stands beside Windmill Lane by Victoria Bridge is thought to have been built by William Clayton. However, it has been re-furbished in 2009 as part of the KRIV project and found to have a solid rock bottom, so it is unlikely to have been for ventilation. Neither did it have any soot inside so it could not have been a chimney for any industry lower down the hillside. It’s purpose remains a mystery – perhaps it was just a folly. 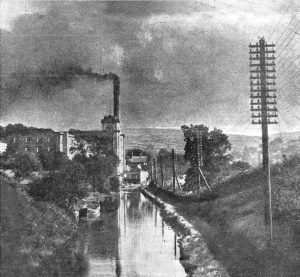 Usually mined with coal, seams of fireclay were to be found under Bollington and stretching to Pott Shrigley and Bakestonedale, all part of the wider Poynton coalfield. The coal and the fireclay were usually one above the other so it made considerable economic sense to mine them both, make bricks of the clay and fire them with the coal. This was how it was done at Hammond’s brick works at Pott Shrigley. Just north of Clarence mill, along the canal a couple of hundred metres, there is a wharf. If you look carefully you will see that the off-side canal edge is formed from large well dressed blocks of stone. This wharf belonged to John Hall & Sons Ltd and served their mine, the drift shaft of which can still be seen, easiest in winter, alongside the field hedge about 150m from the canal. This gently sloping shaft went back under the hill and the output was fireclay. This was loaded onto day boats (those having no living accommodation) at the wharf and, at one time, taken to Dukinfield near Ashton-under-Lyne, to the east of Manchester. So imagine, if you will, the lot of the poor boatman – he would start early in the morning with his horse towing the boat loaded with about 20 tons of clay up the Macclesfield canal. Almost three hours to Marple then onto the Peak Forest canal and spend two hours getting down the 16 locks. A couple more hours to Dukinfield, tie up and assist unloading the clay by hand. Turn the boat, head off back up the Peak Forest canal, two more hours up the Marple flight and back along the Macclesfield to Bollington. A good sixteen hours work; time to knock off! Do it all again in the morning! It is said that they actually did this trip twice a week. 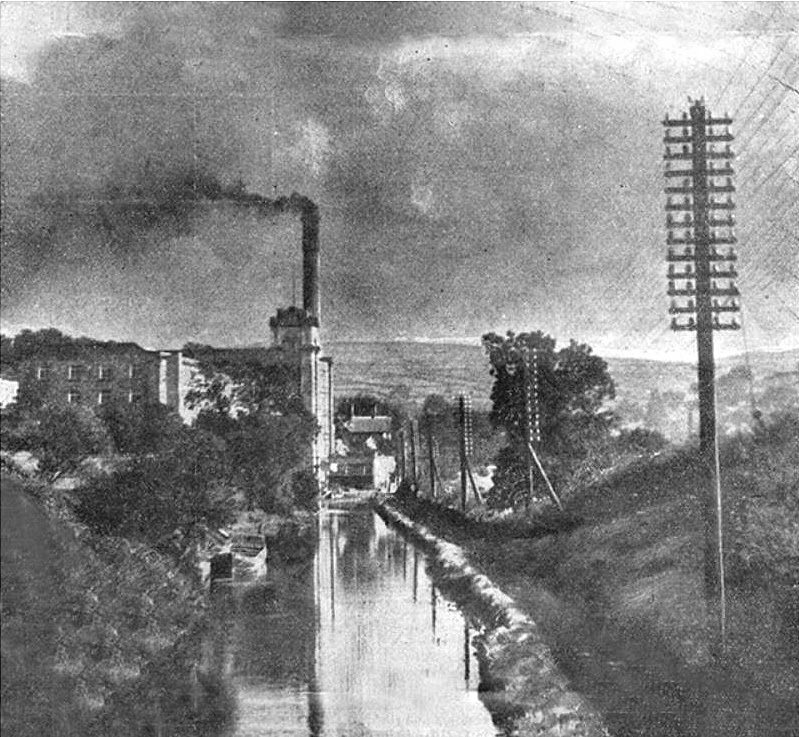 The above photo is taken from Sugar Lane canal bridge around 1934. 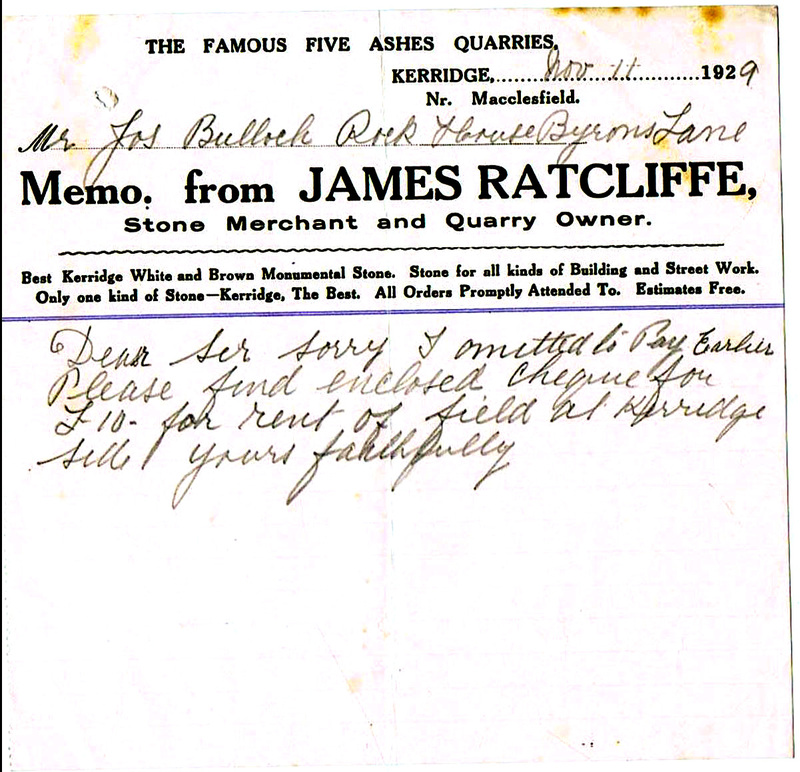 The boat on the left is at the wharf for the Clarence Fireclay mine operated by John Hall. Clay and a small amount of coal was brought from the mine off the fields to the left in tubs or tipped down shoots to the boat. The boat was most likely named Benefactor as this was a regular on this run at this time. The mine closed in 1938. Notice on the right of the canal the line of telegraph poles. These were a regular site in the mid-20thC. Each pair of wires (one on each insulator on the pole) provided for one telephone line. The canals were commonly used for this service because they covered large parts of the country and were mostly reasonably straight.